Arm knit your scarf, it’s easy! When I stumbled upon 30 Minute Infinity Scarf tutorial by Audra from “The Kurtz Corner” I got very enthusiastic about this fabulous idea. Since then I’ve been so hooked on this method of knitting that I can’t recall how many times I’ve made this fluffy scarf. I’m sure that it’s the easiest and the most fun way to start your adventure with knitting. Since it's still a bit cold outside, we’ve decided to show you a bit altered version of the tutorial. Our idea was to make it even more helpful, so we used knitter’s perpective. Will you try your hand at arm knitting? We hope that our video will inspire you to give it a go. Tell us about your scarves and share your photos below! It’s beautiful but I’ve still got a problem… When you reach the end of the two first skeins, how do you start knitting with the two other ones? hej Marlena :) wszystkie nasze szaliki robiliśmy z włóczki Combo firmy Himalaya – kupisz ją bez problemu przez internet :) pozdrawiamy! Dziękuję serdecznie :) Również pozdrawiam! I love the music of the tutorial, what is it ? Thank you sooo much for the tutorial, I loved doing it and the result is really beautiful! Great to do on a long air flight!!! … to take away the boredom … and no knitting needles required … just have to be sure you know what to do without watching the video. Very clever and so cosy for the winter! Can anyone help with where to buy this yarn please? Space Warp by DJ T.H. could you tell us where do you live? I would like to make one for a toddler. If I shortened the length would that be suitable? How many ply should the yarn be? I just completed one tonight while watching some old Doctor Who reruns. Tom Baker and his multi coloured scarf was a little extra inspiration… My wife was very amused when I stopped in to buy some wool this afternoon. Could only get 44 meters @ 75 grams though. Still came out quite well. Thicker arms and thinner wool made for some larger loops. But it goes tripled on her, so it’s all good. :D great :) we’re waiting impatiently :D fingers crossed! Thanks for the instruction, couldn’t have done without it. Picture is already down the bottom. The lovely lady from China, who I made it for, is modelling the finished scarf. one question, would you be able to use two diff colours in the main knit? or would it be too much of a jumble of knots to make it work? How do I get my stitches to be tight? It keeps turning out loose and droopy? Ahhh.. Yes. My friends birthday is in a couple of weeks, she asked if she could have one in black. So I just need to find a nice bit of bit of wool blend for that. Also had an idea earlier tonight for a more frilly version, not sure if it will work out ok, but will pick up some stuff for that later this week. So there are most likely some more pics to come later this week/next weekend. Will see how it goes. So I did some digging around in the store looking for a fairly light ball and came up with a blend that was only 50g on a 40m ball, as well as some frilly stuff. The frilly stuff is a synthetic product by Moda Vera called Jazz. There is a sparkly version of it called Tinka too. So picked up all the supplies in black. Added a picture already. No model this time, just a fairly close up shot of the back scarf on a white background. Was try to show the frilly/sparkly bits. Anyways… There you have it, a minor addon to your original. I totally love this tutorial! I’ve made 4 so far. You must go to the bathroom first, and take off your watch and big rings before you start. :D Thanks for the tip! What brand is the yarns that you were using in the video from? Where do you buy it? I live in Toronto, Canada. Thank you for the video girls, simple and clear! I can’t seem to find any yarn thick enough to work with this tutorial. Could you please recommend something in the US other than Combo Himalaya? Thank you! Love this tutorial!! Made a scarf the other day and it came out great except my stitches came out loose and were not as tight as I would have liked them to be. If you have any tip as to how I could fix this please let me know. the description says that you need 4 skeins of yarn, but in the video I only see two. Do you have to knot two skeins together? Or how do I attach the other two ? What if i use 2 skeins of 100gr? Can You show how to do this? What is the estimate length before casting off? I hate to cast off and not have enough or too much. i love it and i cant wait to try it but how many rows should i do? i understand to cast on 12 to start but that is the first row. how many rows should i do total? Hey, all. I’ve found that Martha Stewart Lofty Wool Blend Yarn works amazingly for this knit project. You can find it on Amazon. http://www.amazon.com/gp/product/B005G3QL4A/ref=oh_aui_detailpage_o00_s00?ie=UTF8&psc=1 The downside is the the quantity.. at 26 m per “bundle,” you need about six to complete the double infinity scarf. I haven’t been able to find yarn that works better for though. So thick and comfy! You need 4 skeins 40m each of bulky or super bulky yarn. You knit with two strands at a time. When you finish with your first two skeins, simply tie another 2 to it and keep on knitting until you have about 1.5 tail left. Cast off and join both ends of scarf. Good Luck! Po pierwsze: nie kupuj czystej wełny bo będzie kiepska w utrzymaniu. Do takich akcesoriów najlepsze są włóczki mieszanki wełny z akrylem typ bulky lub super bulky. W każdej pasmanterii lub w internetowym sklepie powinien być spory wybór marek i kolorów tego typu włóczek. Pozdrawiam i życzę udanego dziergania na rękach! so no counting just knit until you get to the end. thank you! Hey I really want this exact color and texture where do I get this yarn? If I wanted to do it but don’t want it so bulky/thick, would using only one skein to start work? You can try, but I’m afraid that scarf will be too thin. If you decide to try let us know how it went. Cheers! bonjour, j’habite en France,où trouver de la grosse laine ? Just made one!! not in 30 minutes but in 45 minutes!!! i love it and so does my sis!!! i have to make more!! You can try Lion Brand thick and quick. Or any other yarn that say #5 Bulky on the label. Mine wasn’t as tight as hers was. Any suggestions on how to make it so it isn’t as loose? you can use any yarn that says super bulky #6. Bernat makes a blanket yarn that is very soft and would be perfect for this project. Mine wound up much looser knit due to having large hands, thick wrists, and not tightening the stitches much in the interest of being able to get it off my wrists. I’m going to look at possibly using 4 strands of #6 instead of only 2 or finding a thicker yarn. How many times do you repeat on each hand? I followed the video exactly, but my scarf is only a few inches wide. They must be repeating on each hand much more than showed on the video. HI, i am trying to identify the diameter on the yarn.. is 5mm too small compared to the one you’ve shown? Why do you need 4 skeins of wool, I can only see 2 in the video for the infinity scarf? Yarn we used to make Infinity Scarf is about 8-9 mm. I hope it helps you…Cheers! In this case, you can try with 3 or 4 strands. Let us know how it went! Cheers! How long did you make the scarf? Did you measure it out for this long one or did you count rows? It came out so ugly, it was so much looser than hers was. I cheated and bought mine at Soulscarf.com . Love it! How do you connect the skeins together? A simple knot? Same. I gave up after two rows and just made one out of large needles instead. It doesn’t have the loopy look her’s does but at least it’s not falling apart like mine was. Very disappointed. Made it with a thinner yarn, came out looser, but love it. I love the pink/purple/black yarn shown in the picture! I’d love to have my scarf with those colours. Which is the brand and details of that yarn? Could you use thinner yarn to make these scarves? not really. that said if you use 3 strands of bulky (as opposed to 1 of super bulky) you can do this, but that means 3x the yarn of what is in the instructions. I did that with a lilac, orchid and a black yarn together for a fun twist. Wow, I made this today, and it really doesn’t take more than 30 minutes! So happy with the result, and really handy tutorial!! Love it!!! This is awesome! I’m just a little confused though. How many rows is it to make it that length? Thanks! Great job! Are you going to make another one? Cheers! @Ammber, you need to tie it harder when you switch a loop on another wrist. You can do this, don’t give up! Cheers! Hi. I live in Norway. Where can I buy the yarn you used in the tutorial? Can I buy it online? what kind of yarn do you use ? Wat doe je op het einde van een bol? Gewoon een knoopje ? I got a huge ball of yarn which is plenty for one scarf. How do you get it to be two strings of working yarn for this project? I just made my first one tonight! It’s a lot easier if you use two skeins of yarn or four if you want a really wide scarf like the one in the pic. For such a long scarf as in our video you need 80m of yarn. Measure up this quantity from one skein 3times and use as one, chunky string to knit. Or, what’s much easier use three skeins of 80m yarn at once. Good luck! Bulky or super bulky of any brand you like. 2 or three skeins knitted at once to make the scarf even chunkier! W każdej pasmanterii lub sklepie online. Szukaj grubej włóczki, bulky lub super bulky i przerabiaj z 2ch lub trzech motków jednocześnie. cast on 12 loops and knit through 12 on each hand, just like on the video. It should work:) Good luck! Ok thank you, just wanted to know because I didn’t know for sure. But thank you for letting me know. I thought it was with two skeins so that’s all I bought can I still make one with two? It def it more than twice on each hand. It seems like several. I will plan on going till I feel like it is long enough. 2 times on each hands makes it big enough for my dog. What song is playing in this video??? It’s great! I neeeeeed to know! When do we stop? Til the very end of the yarns? I would like to try this, but the instructions do not address how to change from one skein to the next (or do you only use one, just double strands of super bulky or 4 of bulky, so there is no joining?) Thanks for answering — this looks like fun! Above in the comments it says 30-33 rows. So 15-17 times per hand or so. Love this! It took me 1.5hrs on my first one (the light blue/dk blue in the pics below). I bet my second+ won’t take as long now that I know what I’m doing. Realized I was looping the wrong direction, which made it more loose than it should have been, but still turned out great! I made mine with only 2 skeins, but the skeins I bought were 80yds each, which is probably why it worked. When you buy a skein (the bundle of yarn you see her holding in the pics), it says on the packaging how many yards are in the bundle. If you get 2 skeins that are 80 or so yards, you’ll only need 2 and not 4. Hope that helps! I have the same question…but I don’t see an answer? I am new to this. What is a skein? A ball of yarn. It’s just a different way to say it. A unit of yarn. Usually shaped like a ball or an oval. @Magdoosh, ta włóczka akurat miała sporą domieszkę akrylu. Sprawia on, że włóczka się nie mechaci tak jak czysta wełniana. Pozdrawiamy! It depends on the scarf length. We made the longer one out of whole 4 skeins. Cheers! About 30-33 rows. We tried it on when we finished whole skeins. It was perfect and it has 30 rows. So it’s optimal amount, but all depends on the thickness of the yarn and your wrists ;) Hope it will help, cheers! @ Grapril, We’re proud of you! You can post some pics below comments section. There is a gallery of users’ scarves :) Cheers! @Kristy, thanks for your hint! Sometimes we don’t have enough time for answering…:] We’re very grateful for your help! A uzyla Pani 4 wloczek po 100gr czy 2 po 150gr?bo jesli 4 to mam gdzies je na srodku polaczyc? It depends on the yarn length. We used four, but each one was 44yd long. If you have longer skeins, two will be enough for one scarf. Ciao sai mica come si deve fare quando un gomitolo è finito? Harder as in “tighter around the wrist”, or with less yarn between the wrists? And where should I pull to tighten it, the working yarn or the other wrist? We’ve made only a video tutorial, but you can turn subtitles on, maybe they help you…cheers! im searching for the yarn, but can’t find anything like that. all yarns are smaller :( Do you know somehow where i can get this yarn (maybe in germany)? I am just a little confused by this reply since it refers to using 3 skeins at once. From what I see in the video, only 2 are used at a time. Am I missing something? You’re right, we used 2 at a time. Third skein is only a an option, if you want to make thicker scarf. Cheers! Maybe you should search on Polish online shops. Some of them are translated to German, so you wouldn’t have any problem with making an order. Cheers! @Blanca, for yarn we used you should have 12 mm needles, so our yarn is much thicker than this one you mentioned in comment. Hope it will help you. Cheers! Hi! Coolest stuff here, congratulations!! Okay, so it’s been a while since I even tried to knit or crochet, I used to be really good. This though, is like a new world to me right now. I see the technique and how to do it… I thought I was doing it right but your scarf in the video has actual stitches you can see. Mine is just like straight rows of the yarn one after another. I tried un doing and re doing multiples times. But I can’t see anyhing you’re doing different then me! Do you know how to fix this, or what I’m doig wrong? @Heather, it’s hard to tell what you’re doing wrong if you’re following our steps…;) hmm maybe check one more time if you create stitches exactly like us. Don’t give up and let us know how it went! Cheers! How long does the scarf has to be before I connect the ends? And when I take four skeins instead of two, do I have to use four strings while knitting? Because you used two in the video :) Thanks for you help, Id really like to knit this as a self-made christmas present :) Great Idea! Can anyone tell me where the written version of this is as counting rows from the video doesn’t work. There’s no written version of this tutorial, you can check the subtitles, which we added to the movie on YT, or just do about 30 rows ;) Good luck! I LOVE this, but I am not sure what to do with the loop I have after casting off at the end. Can someone help? 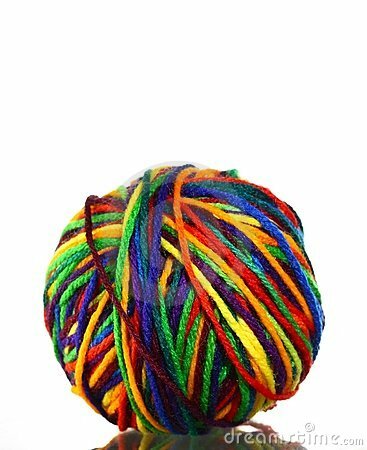 What brands do you use for bulky yarn? Hi! I absolutely love this! I’m trying to do it now, but it doesn’t look at all like the scarf in your video… I get too much air between the stitches when I knit. I bought the thickest yarn I found (perhaps not thick enough? ), and it’s in 100% wool. Am I using the wrong type of yarn? And another issue is that the first stitch that’s a “knot” just won’t sit right when you take it over the first time from one arm to the other. Thanks for the pattern and the easy-to-follow video. I used 2 strands of Lion Brand Homespun Thick and Quick (8 oz.-160 yard skein, color- lagoon), cast on 12 stitches (too tightly, so the seam was a little weird) and knitted @15 rows for the shorter version. The scarf used less than half of EACH 8 oz. skein. The yarn is soft, bumpy and very forgiving so the goofs aren’t that obvious. I’m really happy with my first attempt and can’t wait to start the next one! I’ll try to post a photo. Je crois que cela n’aura pas le même effet! @Ioana, for the longer version you need 2 skeins, each skein should be around 80 m. Cheers! I bought 2 skeins of yarn Lion Brand. Super Bulky 6, 4ozs. 64yds. Is this enough to make a double infinity scarf? You’re welcome! Don’t forget to show us finished scarf! Cheers! We wrote in the post that we used 4 skeins (one skein is 44yd long), so 2 your skeins may be not enough…cheers! Could this be made wider and just not tied together at the ends to make a baby blanket? If so, how would I go about making it wider? @Kimiko, we checked it, it’s all fine. We’re happy that you used our tutorial and that it was such big inspiration for you! We hope you’ll find more inspirational project on our website, cheers! How would the length be affected if I used 70m skeins? hello handimania, may i know the diameters of Super Bulky Yarn that u used? it s kinda hard to find the Super Bulky Yarn in my country. Thanks! thanks and sorry for grammatical mistakes. Yarn usually is just categorized by ‘weight/type’ I use weight 6, which is super bulky. You can probably find the type of yarn you want online. Hola! el hilo que yo conseguí es mucho mas fino que el suyo.. ¿yo usaría entonces 4 madejas de 40m/100g? Cómo haría entonces? ¿Uso cuatro hilos juntos para tejer la bufanda o solo dos? por favor ayudenme. Entiendo algo de Inglés. // Hello! I got the yarn is much finer than yours .. I would then use four skeins of 40m / 100g? How do then? Do I use four threads together to weave scarf or only two? please help me. I understand some English. How long would the yarn have to be? Can u do this with one skein of yarn?